Mt. Si manages to miss much of the snow of the Cascades due to geography; most moist air can find its way further eastward before being forced out as snowfall. 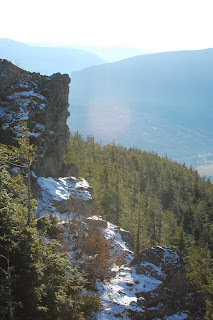 It is a brisk 3200ft climb, and offers spectacular views west to Seattle. Mt. Si featured prominently in Twin Peaks, as it looms over North Bend, where many scenes were filmed (including the title screen).